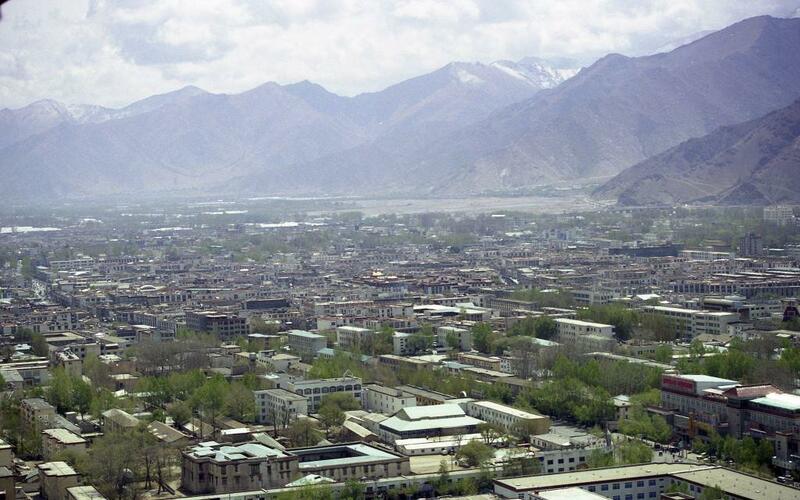 The city of Lhasa lies at around 3650 meters. Lhasa consists of two quite distinctive parts: one part is primarily Tibetan and centers around the Jokhang Temple, which is the most holy site in all of Tibet. 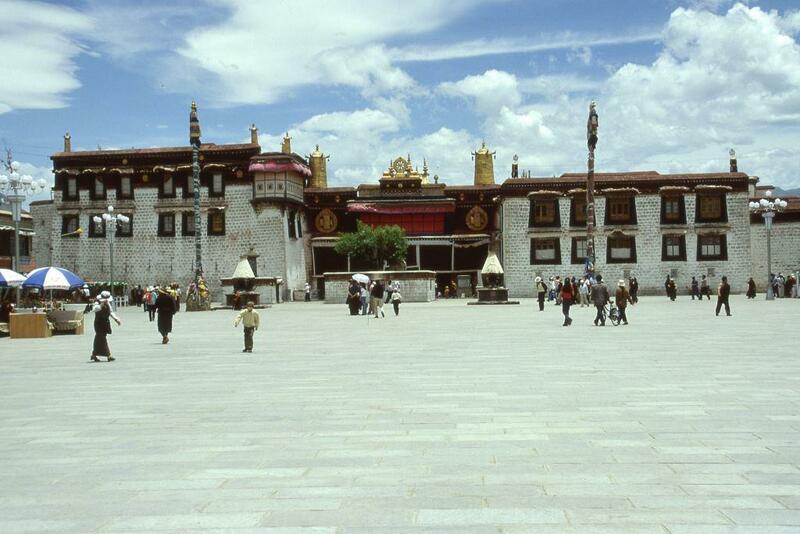 The Jokhang Temple is the spiritual center of Tibet. Its oldest parts dates from around 7th century AD. Photo: (C) Marius Warg Næss. 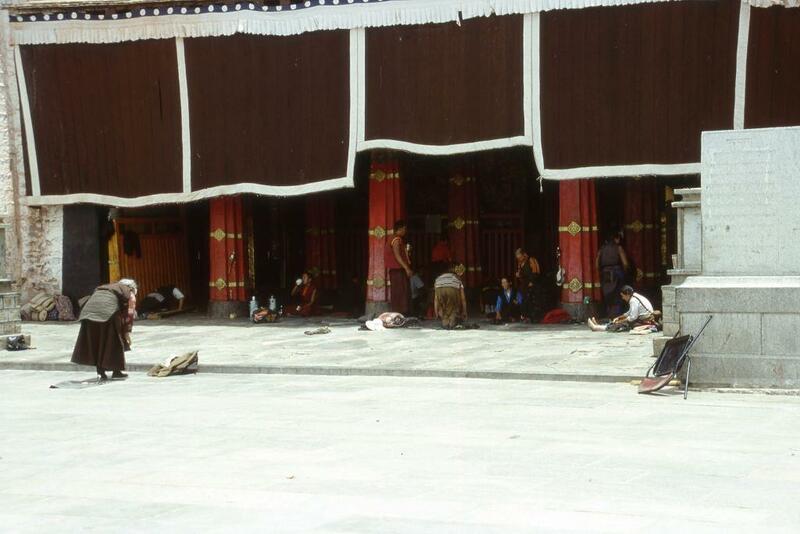 The main entrance to the Jokhang temple. Photo: (C) Marius Warg Næss. 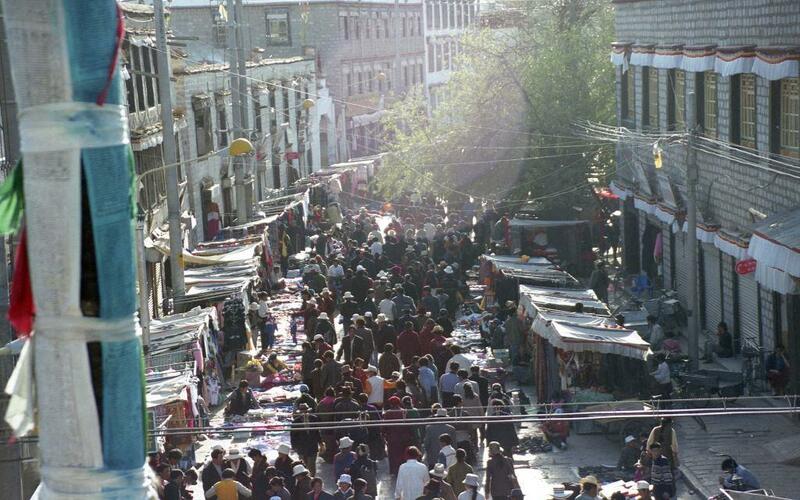 The heart of of the Tibetan section is the Barkhor, a street that is encircling the Jokhang. The Barkhor is a sacred pilgrim path, a lively marketplace and a social center. Pilgrims walk clockwise around the temple twirling prayer wheels and chanting mantras. Others go around the street in prostration. Photo: (C) Marius Warg Næss. 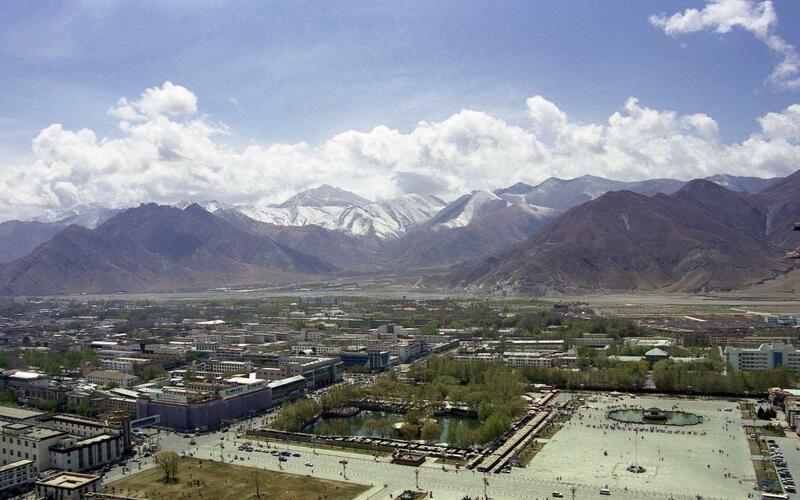 The Chinese section of Lhasa was built around the base of the Potala Palace. The Potala Palace was mainly built during the 5th Dalai Lama’s (who moved from Drepung to the Potala) reign, between 1645 and 1693. The main entrance of the Potala Palace. 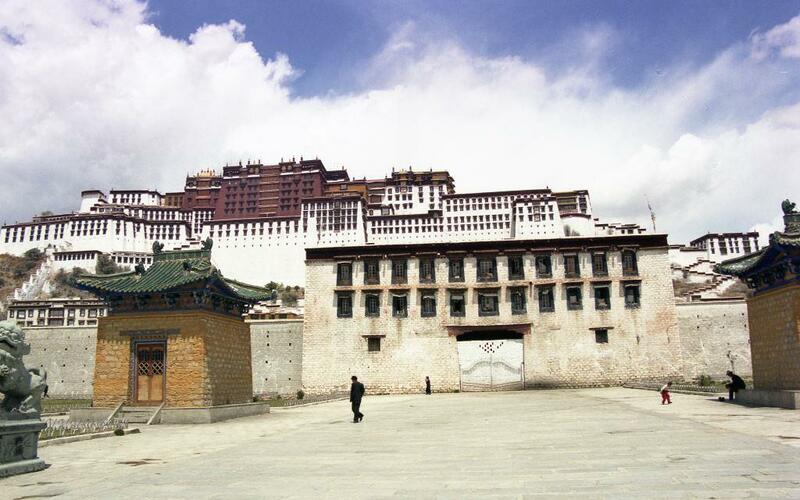 The Potala consists of a White Palace used for secular purposes with living quarters, offices etc. The Red Palace had religious functions with tombs, assembly halls, chapels, shrines and libraries containing Buddhist scriptures. The yellow portion between the Red and White Palace housed giant thangkas. Photo: (C) Marius Warg Næss. The Potala have around 1 000 rooms that contained the living quarters for the dalai lamas (at least during summer) as well as their tombs when they died. 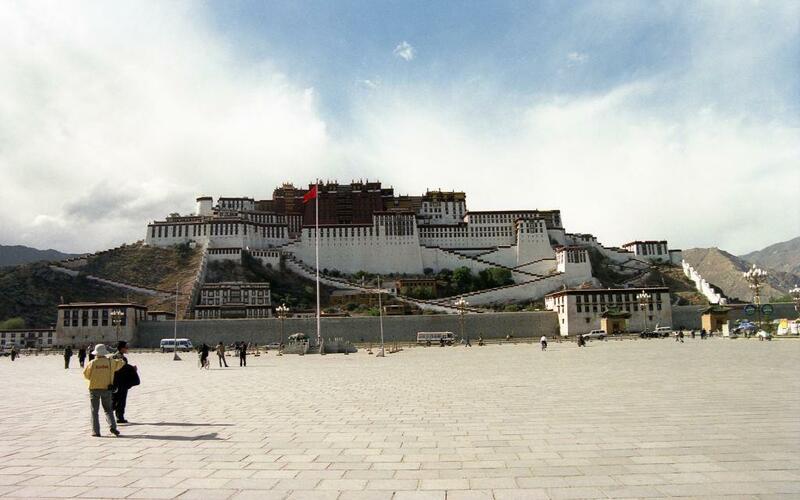 The Potala Palace forms the basis of the Chinese section of Lhasa. 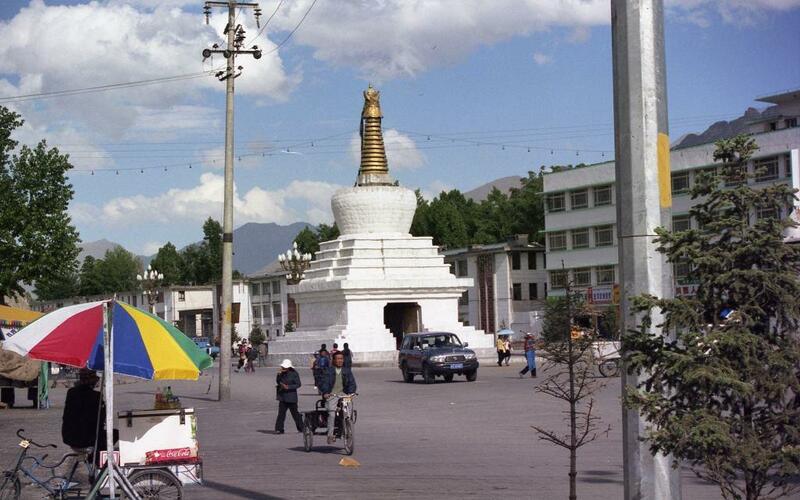 The Tibetan parts and the Jokhang Temple is located in the left direction (out of sight). Photo: (C) Marius Warg Næss. As one can see (if looking closely) the architecture changes at the far left to a more Tibetan style. View from the roof of the Potala Palace. Photo: (C) Marius Warg Næss. 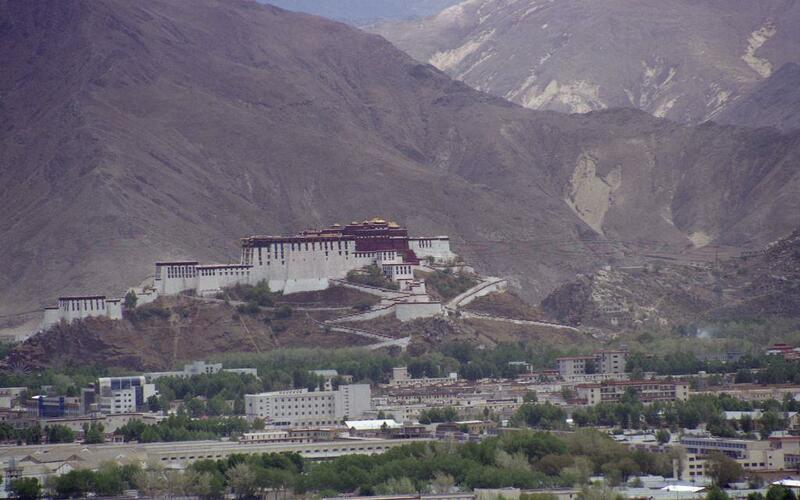 The Potala Palace sits on one of two defining hills in Lhasa (called the red hill). The other hill, called Chakpori or Iron Hill, is the second. Now its defining feature the tall antenna. 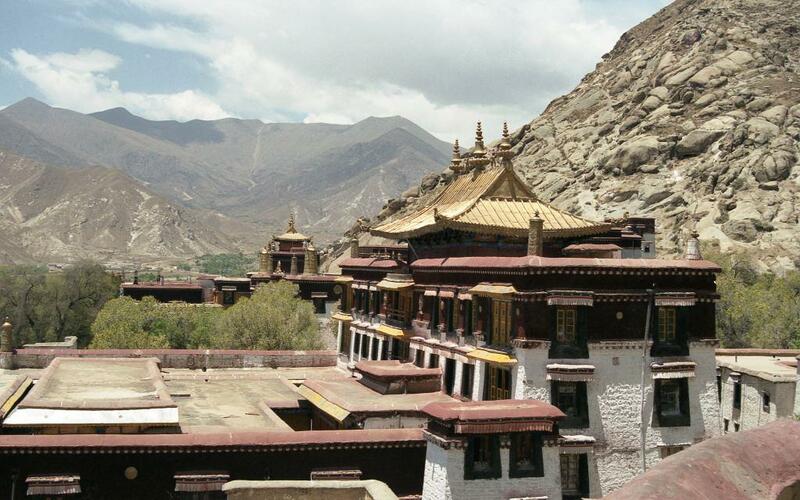 Since it is one of four holy mountains of Central Tibet, it used to be the site of traditional Tibetan medical school. Photo: (C) Marius Warg Næss. 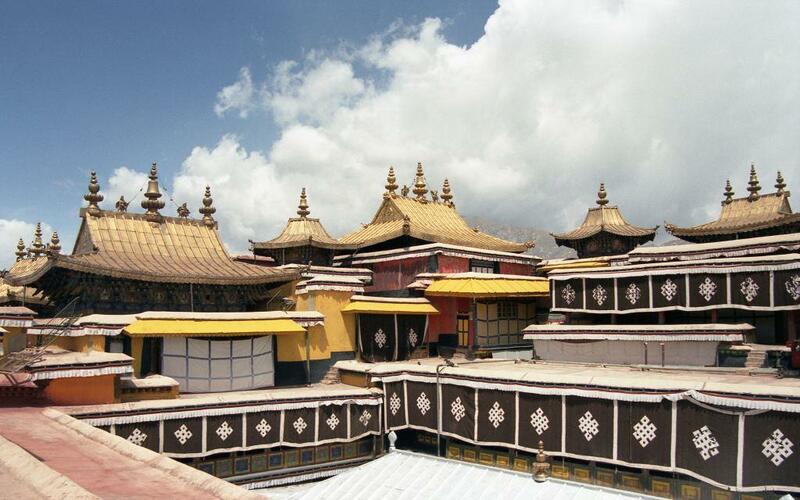 The Roof of the Potala Palace. Photo: (C) Marius Warg Næss. 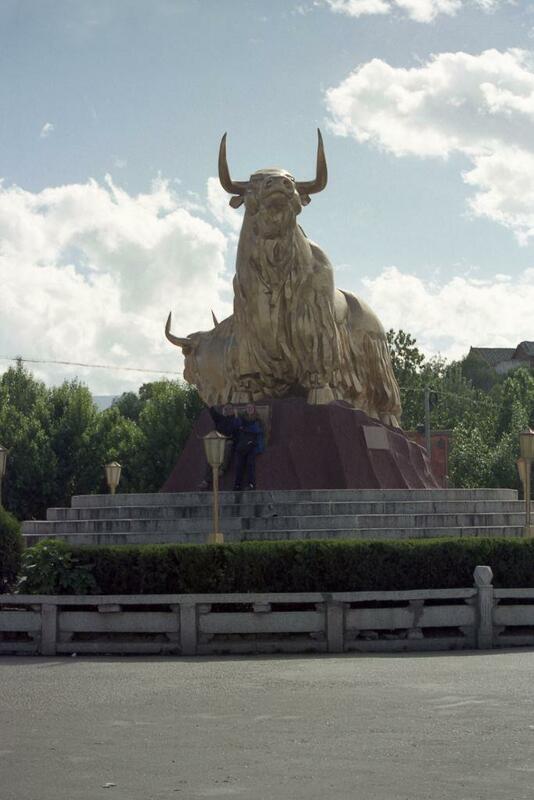 Golden yak statues in Lhasa. Photo: (C) Marius Warg Næss. 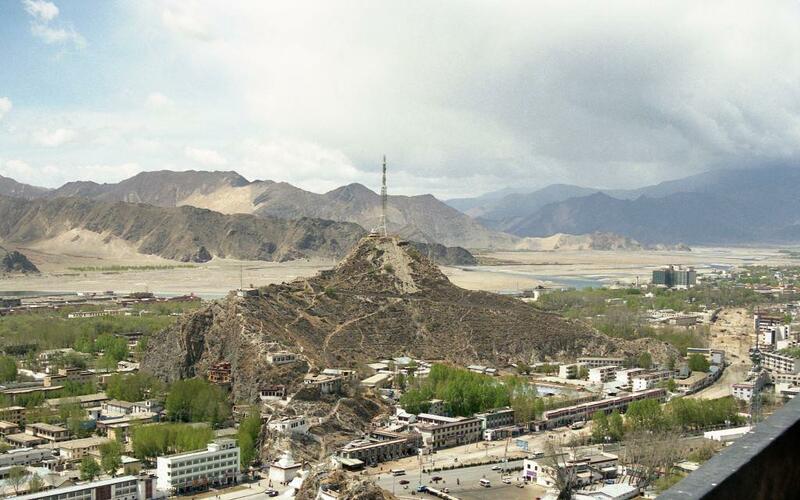 Chorten (stupa) in the middle of Lhasa. Photo: (C) Marius Warg Næss. 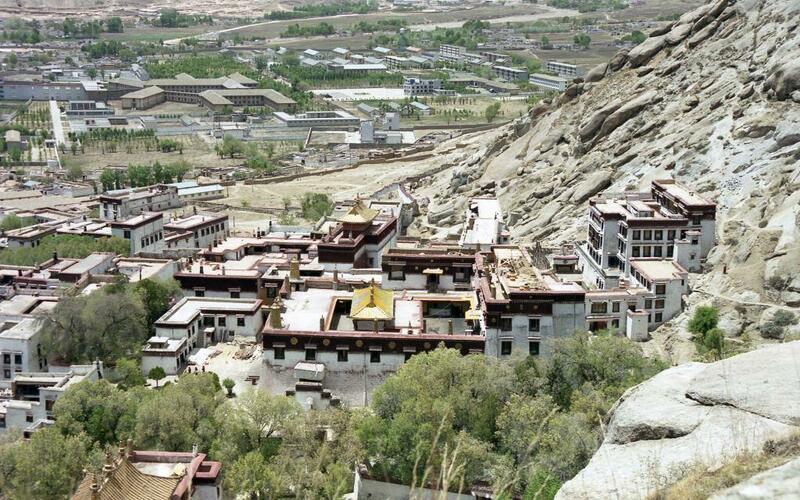 Around Lhasa there are three main monasteries: Drepung, Sera and Ganden. All of them are part of the Gelukpa (also called Yellow Hat Sect) school of Tibetan Buddhism (the school of thought most known for the Dalai Lama). I only managed to visit Sera and Drepung since they are closest to Lhasa (Ganden is located around 45 km away). 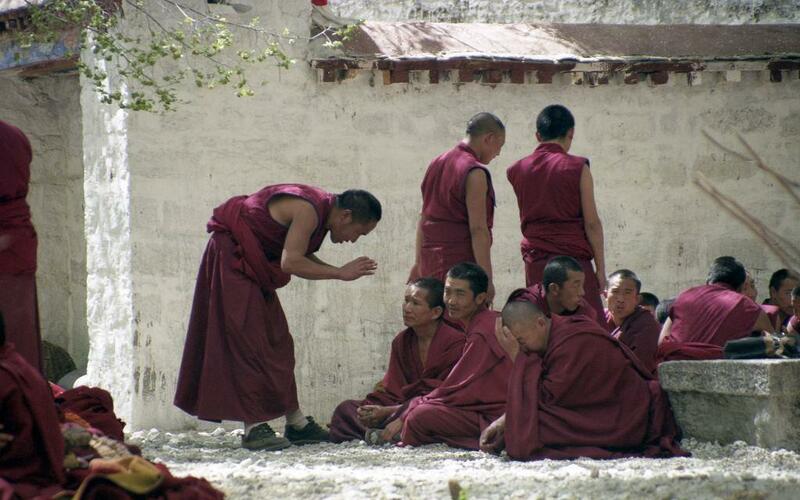 At its height of power, Drepung had over 10 000 monks. 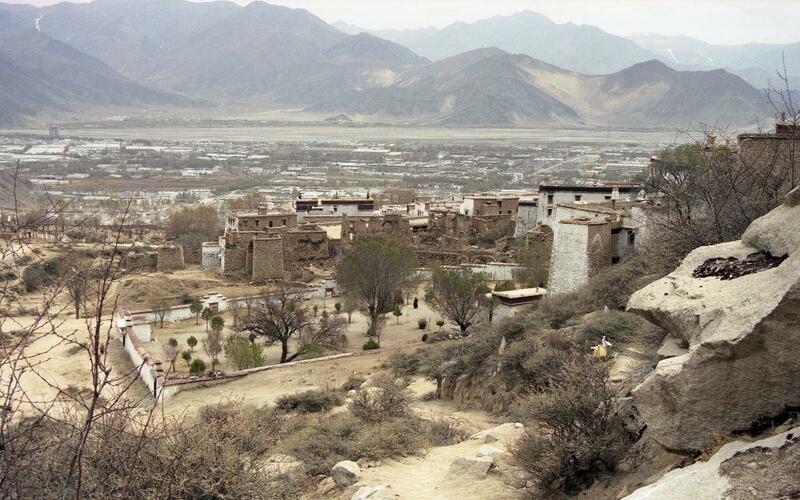 As can be seen from this photo, Drepung was significantly damaged during the cultural revolution (a campaign to destroy the four olds, i.e. old ideas, old culture, old customs and old habits). Today around 400-600 monks live at Drepung. Photo: (C) Marius Warg Næss. Both Sera and Drepung were traditionally very large monasteries that had a lot of power. Under the rule of the dalai lamas, monasteries did not have to pay taxes and formed independent economic units. The Dharma wheel is one of the oldest symbols of Buddhism. When it is supported with two deer, a buck and a doe, on either side it symbolizes the first sermon given by the historical Buddha after his enlightenment. Photo: (C) Marius Warg Næss. 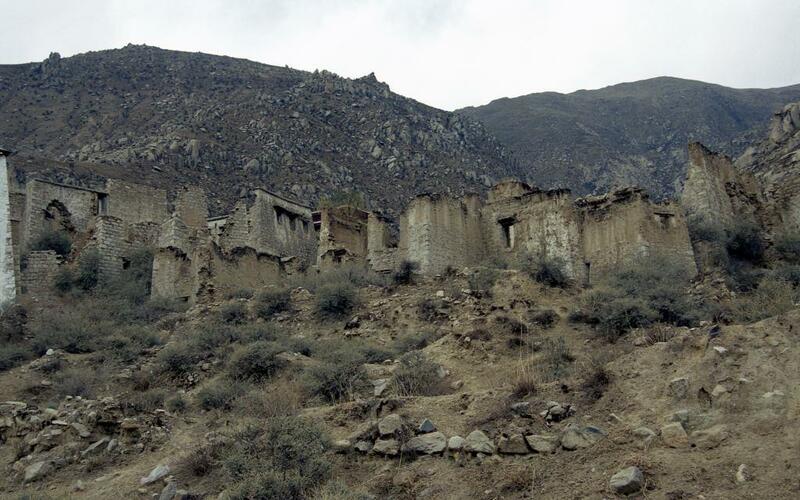 Moreover, if they owned land, local peasants and nomads worked there as serfs, requiring them to pay taxes to the monasteries.The Aru nomads (Tibetan lives: Nomads in the Aru Basin), for example, were under the direct control of Sera. 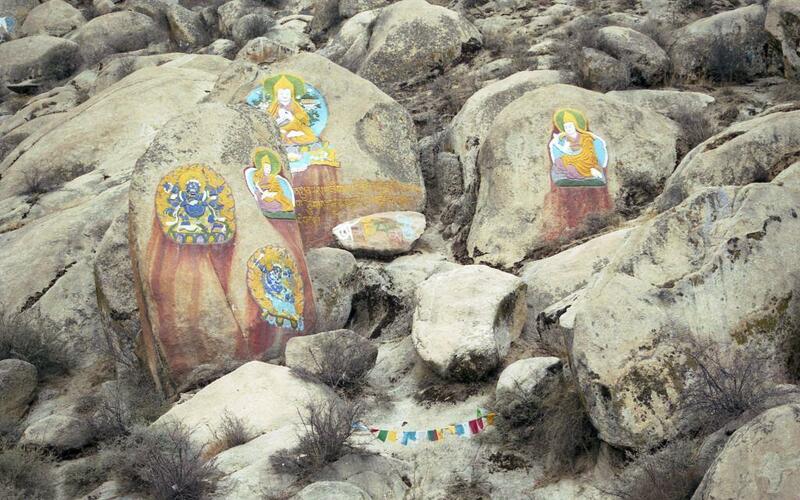 Rock art in the hills at Sera or Drepung (can’t remember which!). While cannot be entirely sure, I think that at least Tsongkhapa (founder of the Gelukpa) and Yamāntaka are represented. Photo: (C) Marius Warg Næss. As subjects of the Sera monastery in Lhasa the Aru nomads were obligated to pay a part of their production to the monastery as annual tax. They could choose if they wanted to pay in live animals, 1 yak or 6 sheep or 7 goats, butter and cheese, around 2.5 kg of cheese or 5 kg butter, or one bag of goat cashmere (based on a household owning 100 heads of livestock). An official representative from Lhasa came and collected taxes once a year. Top left: View of the backside of the Potala Palace as seen from Sera. 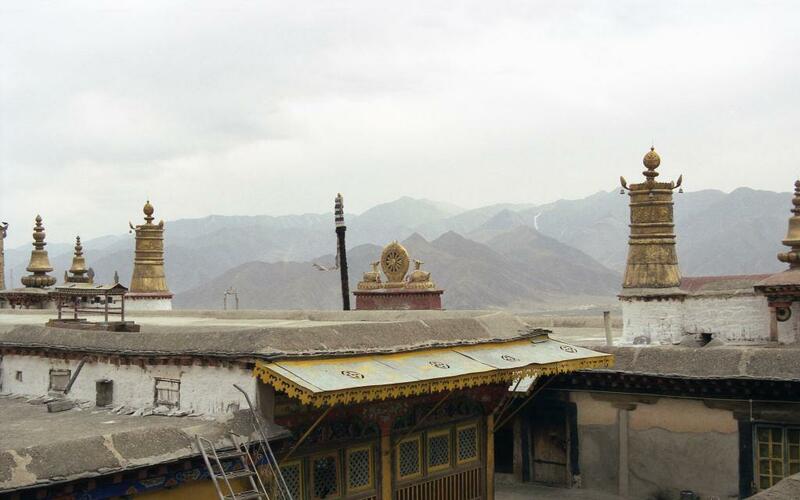 Top Right and bottom: Photos of the Sera monastery. Please note that it has been a while since these pictures were taken so I cannot be 100% sure about which pictures are from Sera and Drepung. 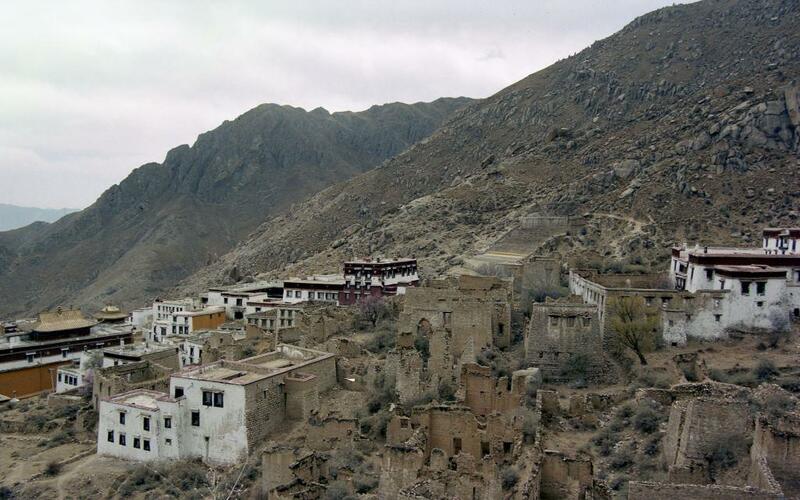 Rule of thumb: if it has ruins, it is Drepung. Photo: (C) Marius Warg Næss. When walking around Dreping, I came across a park where monks where debating. You could hear the voices from far away and they were talking at high speed, only interrupted by the sound of hands clapping punctuating the arguments. I only took pictures from far away because I was afraid to disturb/interrupt them. When I later went to Sera, however, I got a bit closer to the monks debate and were allowed to walk and take picture close up. 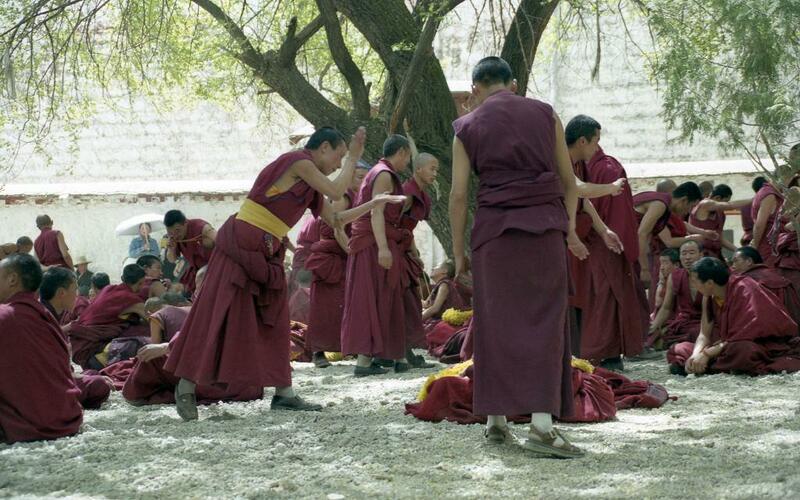 Monks debate in a garden at Sera. 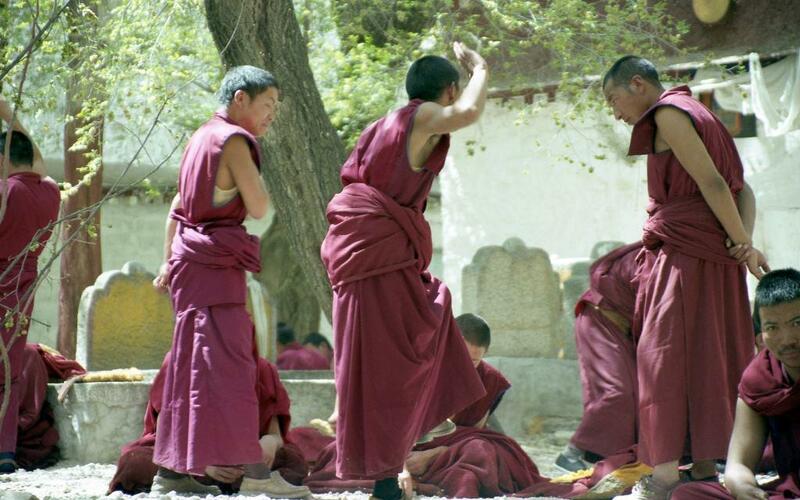 Debates occurs at high speed, often with one monk sitting down being “quizzed” and the standing monks doing the “quizzing”. Hand claps are often to end a statement or for making a point. Photo: (C) Marius Warg Næss. Lopez Jr, D. S. (1997). Religions of Tibet in Practice. Princeton University Press. Thurman, R. A. F. (1991). The Central Philosophy of Tibet. Princeton University Press. Powers, J. (1995). Introduction To Tibetan Buddhism. Snow Lion Publications. Goldstein, M., Kapstein, M. T. and Schnell, O. (1998). Buddhism in Contemporary Tibet: Religious Revival and Cultural Identity. University of California Press. Next postWhat’s killing the reindeer?